This one was so much fun to make. I'm thinking this will be going to Ethan's teacher for the end of the school year (can't believe that's coming up soon). How about if the E 2 comes you do a video of you opening it so we can share your excitement ...I hope it comes today.. I hope it comes in for you today. I am excited to see all the things you will be showing us. I love your videos. You are great giving tips and going through the steps one by one. You can't go wrong with your instructions. I don't mind not having a video tomorrow on a project. I would rather have one on the E2. I did not pay for fast shipping. It says mine should be here by may 6th. By the way are you going to do something for National Scrapbooking Day? I hope so. can't wait. By the way your card is so cute. I love the apple. I have this cart and have not yet played around with it. But as soon as I get my E2 I am sure I will play with not only this cart but all the others I have. Love your videos and I happen to have this cart. So thank you! Can't wait to see what you think of the E2. I watched HSN all day and decided not to get it (needed $$ for other things). :) Hopefully, they will have more to sell later on. ???? I was thumbing through the book for this cartridge last night, saw this image, and said how odd. Now that I've seen your card, I have a new appreciation for the cartridge. Thanks for sharing. I sure hope you get your E2 today. I loved the card it is so cute. I love shaped cards and need to make more of them. I have the Imagine and do most of the cards unless I am using the imagine carts. on my gypsy anyway so I can conrol where the it cuts. What a cute card! I always learn new tricks for my gypsy from your video's. Thanks! After seeing your video's, I think I might want this cartridge too. love your videos and looking forward to you sharing ways of using the E2. I purchased this also, but will be receiving it by May 6th. I have a Gyspy and would like to use it on my new E2. Just afraid of the steps. Haven't configurated the Crucit with the Gyspy yet. Any help would be appreciated. Love this card it's very cute! It makes me wish I had a gypsy. Can't wait to see another card from this cartridge. Hope you get your EC2 today! I absolutely LOVE that card! YOu make it seem so easy! And I love that I have your video to go back and teach me how to do it! Thank you for these videos! Love this apple card! Having such a fun time watching these videos and I'm itching to get in my craft room and create! I ended up buying the E2 yesterday too...I just couldn't make myself pass it up! I figured I made money on it because it was just $344 but comes loaded with cartridges at a retail value of $90 a cartridge. LOL! That's my justification and logic! Thanks for all the videos...I always get excited when I see a new email from Creations With Christina! Really terrific card. I love watching your videos, I always learn so much. Can't wait to see what you create with the new E2! I ordered mine 5 minutes into the program. I don't have a shipping confirmation yet. I will be up all night checking for it. I am so excited for you to teach us something we didn't learn on HSN. Good luck with your expected delivery. Remember not to stay up all night. I am excited for you to get your E2, as I am awaiting for mine to arrive also. I love the card, and cannot wait to make it. You have taught me so much, as I am just a newbie, but am having so much fun making cards. Will I need to purchase a gypsy even though I have ordered the E2? Thanks again. This is an adorable card! Can you "group" images with the design studio too, or do you just "flip" & "weld" to create a shape card with any image? Thanks for your great instructional videos!!! Ethan's teacher will love this card. Who wouldn't? I've been dying to get this cart. I'm so excited for you today. I can feel your anticipation! I think it will come! My fingers are crossed for you! Great card! You r so clever! Such a cute card....I want to make this with my grandson for his teacher. I love the videos. I leaned a couple of tips also. Very nice card. Hope your expression gets to your house soon. Thanks for all your hard work. Awesome job! Such a darling card -- great directions, too! Many thanks!!!! Banner ideas - mother's day or graduation banners since those are coming up in May. Really cute. It is hard to believe that this school year is almost over. Great video! Really good idea. I always learn something new when I watch you! Thanks!! 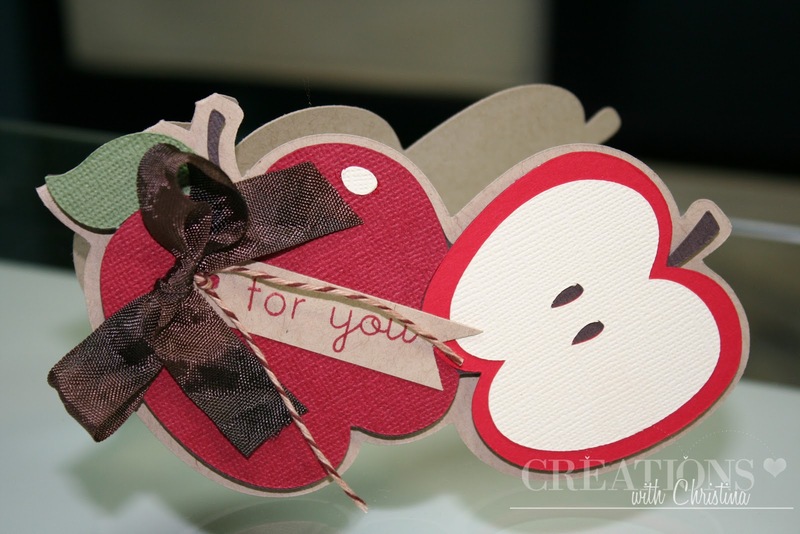 Christina C.
Super cute apple card!! Crossing my fingers for you!! How exciting the E2 coming. Love this card too!! I love this card. How cute of a card to give to a teacher!!! I don't own the gypsy at all but I would love to be able to make shaped cards with my expression. Is there a way to do it without the gypsy? I loved your card and lifted it. Check it out on my blog! What I like about your videos is you! You explain things so well and your voice doesn't get on my nerves like some tutorial voices can. You make things that are usable. Count me in as your biggest fan!! I love this card, and I totally lifted it from you! Hope you don't mind! I just got a Gypsy, and making this card was the perfect way to practice using it. Plus, I needed a Congratulations card for my daughter-in-law, who just secured her first teaching job, and this was perfect for her!!! Visit my blog and check it out ~ I think it turned out great. Your instructions are so clear and easy to follow. Thanks for your videos ~ I love them, and I've learned more from them than anything else I've viewed or read. Keep up the good work making them!!! !